Crossway Books has released another book on the Trinity. Last summer, Fred Sander's book, The Deep Things of God, came out, and I was able to read and review it over Christmas break. It was a phenomenal book. 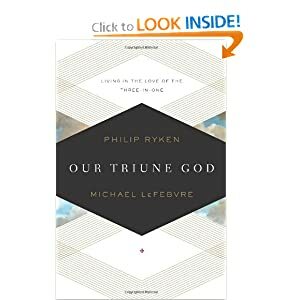 Of course, not everything that can be said about the Trinity has been said, but I was curious how the authors of this volume, Philip Ryken and Michael LeFebvre, would distinguish it. Whereas Sanders approached the subject philosophically, but not to the exclusion of the Biblical revelation, Ryken and LeFebvre approach the topic biblically, but not to the exclusion of philosophy. This book is half the length of Sander's book. It has four chapters. The first chapter, The Saving Trinity, is an exposition on the opening prayer in Paul's letter to the Ephesian church. The second chapter, The Mysterious Trinity, is more philosophical, but surveys the Old Testament, looking at the bread crumbs left by God to point towards the New Testament's fuller revelation. The third chapter, The Practical Trinity, is an exposition of Jesus's discourse on the night before his betrayal, from the last third of John's gospel. The final chapter, The Joyous Trinity, is a survey of Luke's gospel and the repeated demonstrations of the Trinity, Image via Wikipedia including Jesus's baptism and transfiguration. I read this on my Kindle, and it is so much easier for me to highlight great passages and share them here. However, I do not have page numbers. Salvation is administered by the Father, accomplished by the Son, and applied by the Spirit. To express the same truths in yet another way, the salvation that was planned by the Father has been procured by the Son and is now presented and protected by the Spirit. The Holy Spirit is sometimes considered the forgotten member of the Trinity. But this is because the Holy Spirit is always directing our attention to the Son and thereby fulfilling the Father’s plan of salvation. “Father” is the preeminent title for the First Person primarily because it teaches us that he is the source of all the Trinity’s purposes. Jesus wants us to see God the Father as the source of the love behind the Son’s work for our redemption (cf. John 10:14–18). Jesus is explaining that he is the one who fulfills the Vinedresser’s purpose for Israel. The fruitful vine that Israel failed to be without Christ, we now become in Christ. We often succumb to the mistaken idea that “God’s chief end is to glorify me and help me enjoy myself forever” and that Jesus’ death was to pay for my sins so I can keep on enjoying my life without God getting on my case. In his Upper Room Discourse, Jesus gives us a vision of the First Person of the Trinity that challenges that error. “Do not rejoice that the demons are subject to you in my name, but rejoice that your name is written in heaven.” Then he said, “I am perfectly content.” This is the deepest source of the believer’s joy through life and on into eternity: our salvation is not based on what we have done but on God’s saving grace, for our names are written in the Book of Life. This powerful gift happens to be the best gift that Jesus could possibly send us because it is the gift of God himself. Like the Father and the Son, the Spirit himself is divine. This makes Luke 24:49 one of the most strongly and completely Trinitarian verses in the entire Bible: “And behold, I am sending the promise of my Father upon you. But stay in the city until you are clothed with power from on high.” This verse is spoken by God the Son with reference to both the Father and the Spirit. Jesus is telling us that the gift of the Spirit is sent from the Father and the Son. To receive this parting gift, therefore, is to receive the gift of the triune God himself. Despite all these great insights and the great format, a Biblical survey of the doctrine of the Trinity, I was unsatisfied with a couple aspects of the book. This is written from a distinct reformed position. Having read Sanders, I expected a big tent perspective. Sanders attempted to show from all evangelical quarters a Trinitarian orientation. But Ryken and LeFebvre prefer to quote almost exclusively from Reformed sources and use the lingo peculiar to their stream. They also write with Reformed presuppositions, so that, occasionally, I would see assertions without references to support them. For example, they write, "God's chief end it to glorify himself and enjoy himself forever." I am familiar with the Westminster Confession that begins with man's chief end is to glorify God and enjoy Him forever. But this twist on that statement sounded strange to me. I would have appreciated a reference to understand their statement. A book written with so many presuppositions and lack of references for them, leaves the reader, such as myself, bewildered at times and detracts from the reader's experience. Overall, I think this is a great book. I loved their approach, in contrast to Sanders, of a Biblical exposition of the doctrine of the Trinity. I only wish they had written more inclusively and adequately explained some terms and provided sources for their presuppositions. The shortcuts may have saved some ink, but it makes some of the ingredients taste like substitutes, like when your mom puts chopped up vegetables in your meatloaf. It makes the loaf taste a little funny, but gets the stuff you don't like past your selective palate. I'm thankful to Crossway for providing a free copy (for my Kindle) to review.